NUJ members report being hit in the neck with stones, kicked and knocked to the ground – all while trying to do their jobs. Britain’s trade union for journalists has raised concerns about a rise in far-right attacks on reporters and photographers. 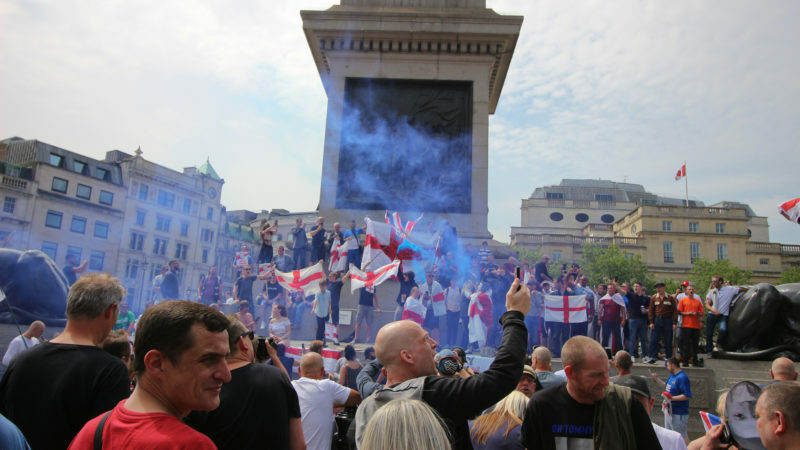 The NUJ has reported an alarming spate of recent incidents of intimidation, threats and violence carried out by far-right protesters systematically targeting its members, especially photojournalists. The union has called for stronger action from the authorities to defend press freedom and tackle the perpetrators. Among more than a dozen incidents recently reported to the union and shared exclusively with Left Foot Forward, a Tommy Robinson supporter is alleged to have pushed a camera in a photographer’s face and a photojournalist was assaulted and threatened by Yellow Vest UK organiser James Goddard in front of police. On other occasions a photographer was dragged into a crowd and repeatedly assaulted, a journalist was punched in the back of the head and two reporters were threatened with murder. NUJ members report being hit in the neck with stones, having their cameras grabbed and on one occasion struck with a flag pole, being kicked in the legs, pushed, knocked to the ground and forced to stop filming and leave the area – all while trying to do their jobs. Michelle Stanistreet, NUJ general secretary described the increase in violence as disturbing. “The evidence provided by NUJ members to the union highlights a disturbing increase in attacks and threats both offline and online,” she said. The National Union of Journalists has asked the Metropolitan Police and the National Police Chiefs Council to engage with the union and its members to discuss how policing can be improved to better protect journalists. As it stands, journalists report frequently being asked by police to leave the area on far-right marches and not to attempt to film the protesters for their own safety, which prevents them from doing their job. Natasha Hirst, chair of the NUJ photographers’ council, stressed that more must be done to protect photojournalists and other reporters covering the news, and risking their own safety to do so. “Our members are highlighting repeated obstructions and hostility as they try to go about doing their jobs.” she said.